This book was given to me by a neighbor, with whom I'd recently been discussing favorite books. It was one of her favorites and she thought I'd like to try it. I'm glad she brought it by my house because I'm sure I would never have heard of it if she hadn't.The book,first published in 1952, is about a family coming out of the great depression. It shows the power of a mother and her influence, not only in the home but on the community. Each chapter was a story itself. I very much enjoyed it and appreciated the recommendation. This book was delightful to read. 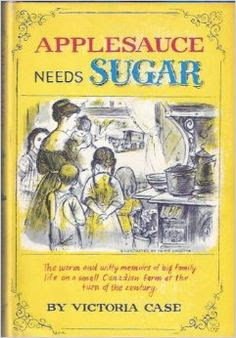 This wonderful book was written in 1946 and is the warm and witty memoirs of a big family living on a small Canadian farm at the turn of the century. "Mamma never prayed for anything she could get by her own efforts, or anything we could go without, and even now she didn't pray for bacon or money or fresh mean, or even milk to put on our mush, but she prayed for sugar." It took me a couple of year to track down a copy of this book and it is now a cherished item in my book collection! I think this is the first book I've ever almost completely identified with the protagonist...all the way down to the number of children she had. There were so many lessons in this book it would make a great read aloud. This is now a classic for our home. This is such a fun read. It reminds me a little of Cheaper by the Dozen with the fun and quirkiness of a big family, but in this story Mama is a force to be reckoned with. Canadian newlyweds try to make their way during the depression in the late 19th century. They start from Ontario, go to Texas then end up in Victoria. The book consists of a collection of short stories published in the 1940's. Not as fun as I had hoped. The wife wasn't the most pleasant of characters (IMO) but I enjoyed reading about early days in my old stomping grounds of Victoria. What a fun period piece. It reminded me of Little House on the Prairie from an older perspective. I admired the main character and appreciated that she was as deeply flawed as the rest of us. Slice of life stories like this one remind me that we need to ask our parents and grandparents and other older relatives for their funny and memorable stories. This is a great bunch of stories about a strong woman who lives through some hard times. I enjoyed seeing how she made it through. It was a quick, good, fun read and I think that some of the stories have changed me a little. At least I hope they have. I liked it. It's a good book for figuring out that you can do things even if they see impossible. It's probably good for any age, but as an adult, it's inspiring. I gobbled this book down in one day. It was an easy fun entertaining read. True story of a family from Canada living in the turn of the century trying to make ends meet with a very large family. One of my favorite books. Features a stellar mother.